Size:11' x 32" x 6"
Size - 11' x 32" x 6"
New model available! The Bote Breeze has been rebranded for 2018 as the 11' Bote Flood Inflatable. Click the Image below to be taken to the latest version. 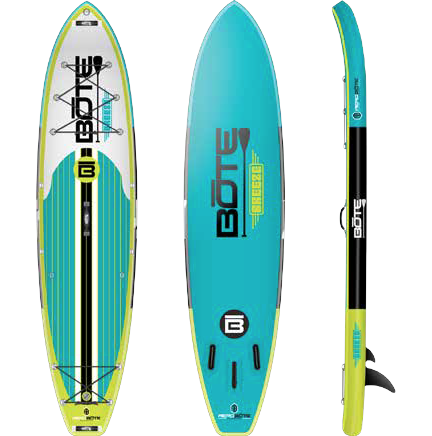 From Bote: Here me now and believe me later, the 11 foot BOTE Breeze inflatable paddle board is the next evolution in paddle board technology. 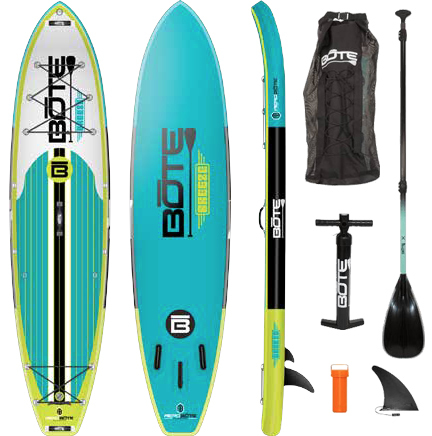 The go anywhere, do anything Breeze is a rough and tumble inflatable paddle board that transforms from a fully functional SUP into a form factor small enough to fit in a back-pack in under 30 seconds. Trek into those hard to reach hunting and fishing grounds with the lightweight Breeze inflatable system strapped to your back. And don't worry about scratches and dings because the military-grade PVC skin is virtually indestructible. 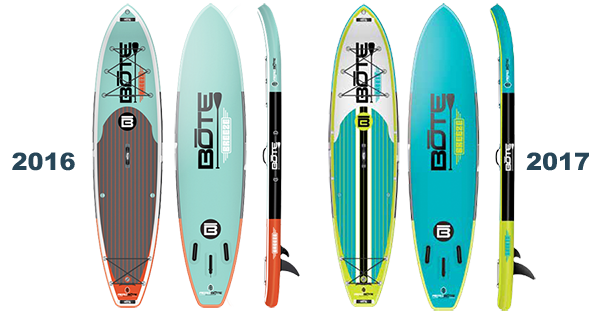 Our Opinion: The Breeze has been a board in our rental/demo fleet for years. Every year it gets a little better, whether its the look or technological advances of the board or its accessories, its always improving! This year is no different, we use is for everything from casual paddles to running rivers in Colorado. The stability is quite impressive and you can't ask for a better looking graphic! Because of the volume and width, you have the ability to really load it with gear if you want. Holding your gear is a Breeze with the front and rear bungee tie downs. You also have cleats built in to secure a cooler to. Overall the quality, durability and amazing looks make this the perfect package for under $1000!! 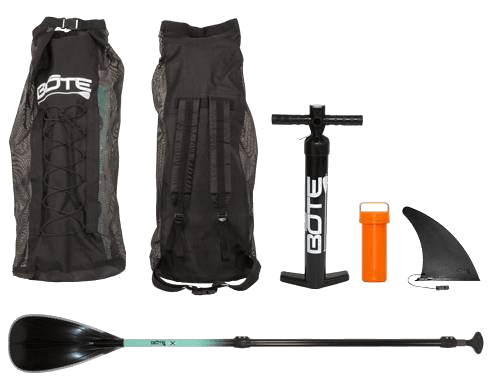 In addition to all the awesome features found on all their inflatables, the Breeze also come as a complete package and includes a durable travel bag, pump, repair kit, center fin and an adjustable 3-piece paddle. Bag - The Breeze comes with a standard bag to hold your board and all your accessories. The travel bag also features backpack style shoulder straps for easy transport no matter where you go. Bungee tie downs on the front will allow you to easily take accessories with you. Pump - The included pump and hose includes a pressure gauge allowing you to fill your inflatable to the correct pressure every time. This years pump makes it easier to get the board to its max inflation point faster and easier. Paddle - The adjustable 3-Piece paddle is lightweight and durable. Since it's adjustable, it's always the perfect size. The paddle is another area that upgraded in comparison to previous years. You’ll be a lot happier with this one!